The Wise Scottsman Takes 5th in Cider Shake Contest! Recently, Matthew entered The Wise Scottsman into the Tieton Cider Works‘ Cider Shake Cocktail Mixology Contest. The object of the competition was to use one of Tieton Cider Works’ ciders. They have several varieties including: Wild Washington, Apricot, Cherry, Dry Hopped, Blossom, Tieton Dry, Spice Route, Pumpkin, Cranberry, Sparkling Perry, Cidermaker’s Reserve, Frost, and Wind. The recipe had to be composed of at least 20% Tieton Cider and other ingredients (they had to be purchasable ingredient, nothing homemade). Matthew chose to go with the Dry Hopped Cider as it was in his opinion the most unique and interesting to use. The recipe came about after many failed attempts, but eventually he found the perfect way to treat Tieton Dry Hopped Cider. The sage, cardamom, and green apple flavors are really at the forefront of this cocktail, supported by a backbone of smokey scotch and well rounded Angostura bitters. The name The Wise Scottsman is a play on “Sage” (wise), “Scotsman” (the use of scotch) and “Scottsdale” (where we are from). Tell us what you think of this cocktail. Leave a comment below or find us on Twitter or Facebook and let us know! 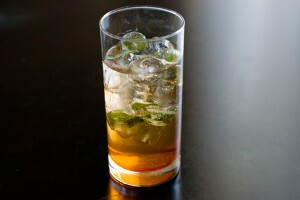 Muddle the sage leaves and simple syrup in a Collins glass. Finish by pouring the cider over the ice. Garnish with a sage leaf. *The Geeks were not compensated or given any comped items to facilitate this write-up but won money from the competition for their placement in the standings; All opinions are wholly our own and were not impacted by winnings. View our Disclosure Policy for more info.